Behind each Vincent rider, there is always a story; a story which sometimes started as a kid in a family owning a Vincent, naturally enrolled in own parents’ passion, or simply when discovering the “Snarling Beast” (1) fortuitously at the corner of a street, fascinated by the enormous 5 inch Smith speedometer indicating 150mph or 250kph. However for the vast majority, the purchase of the first Vincent often came after a long maturation process. But that particular day, all knew that the Vincent was going to be “the one”, and maybe the bike of a lifetime. That could be all, but sometimes opportunities knocked at the door while you even did not think about it. This is the case for Paul Zell. By 1996, Paul used to ride Harley and Honda when he discovered the charm of the old British Bikes during a club ride. For weeks, this was going to be a central point of discussion, gathering information, advices and documentation. There was no doubt that he was going to buy one, a twin, but which one? Triumph, Norton, AJS, Matchless, Royal Enfield… Eventually Paul made his mind; it will be a BSA A65 Lightning. Then Paul started a research in magazines, looking at the ads and finally spotted one for sale, but when Paul called, disappointment: it was in fact a BSA A65 Hornet (2). However the seller retorted that he also had a 1952 Vincent Black Shadow Series C in pieces that he would like to sell. “I had little idea at the time what a Vincent was, but when I mentioned the offer to friends riders the following Saturday, I knew immediately that the next thing I was going to do is to jump in my truck and drive top speed to that place to pick up the bike” said Paul. 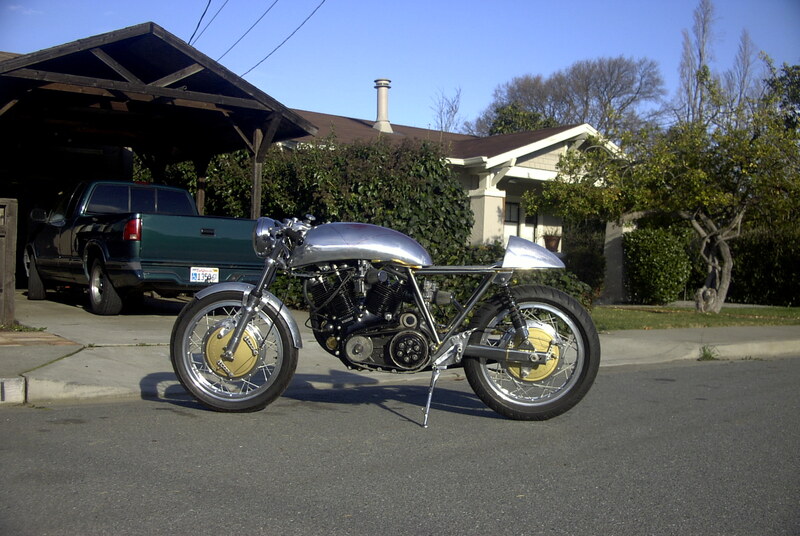 However, there was an ocean between a pair of crankcases and the stunning Café Racer that Paul had in mind, so a long quest of buying parts began to complete the engine: crankshaft, cylinders, heads, piston, cams and gearbox for the main items. For the frame, Paul found an old Egli made by Eric Cheney in the UK. Then came the Ceriani front forks, the Borrani rims, two Grimeca drum brakes from a Laverda 750 and a pair of 36mm Dell’Orto carburetors. With a garage full of parts, it was time to start building the bike. Paul learnt lot from the restoration of his first Vincent but he concedes that building a bike even in kit was another level, so he had to learn new skills directly on the job such how to use an English wheel or to weld TIG in order to fabricate the bodywork. Eventually the project got completed in 2005. 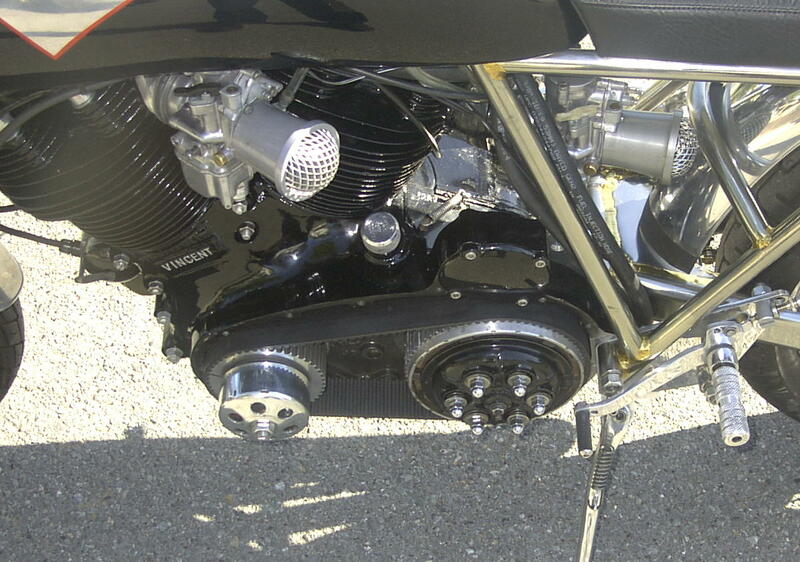 From the 55hp of the Black Shadow, Paul extracted 70hp from his 998cc engine. With a top-notch frame, suspensions and brakes, Paul has the very different bike that he wanted, reflecting his ideas of aesthetics: a Classic Café Racer with a touch of Hot-Rod. As Paul still owns his Black Shadow, which is now hitched to his hand-built sidecar, and a Norvin that he built after the Egli, this makes a quite interesting and diverse Vincent garage. 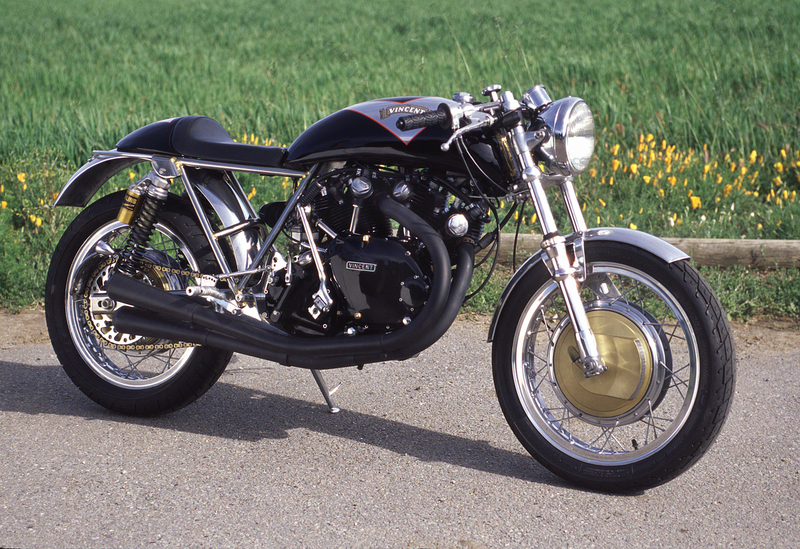 The stunning custom Egli-Vincent that Paul Zell built from a pair of crankcases. Paul also built the bodywork and the exhaust pipes. Californian residents have the opportunity to see this bike quite often on the road, definitely an eye catcher. 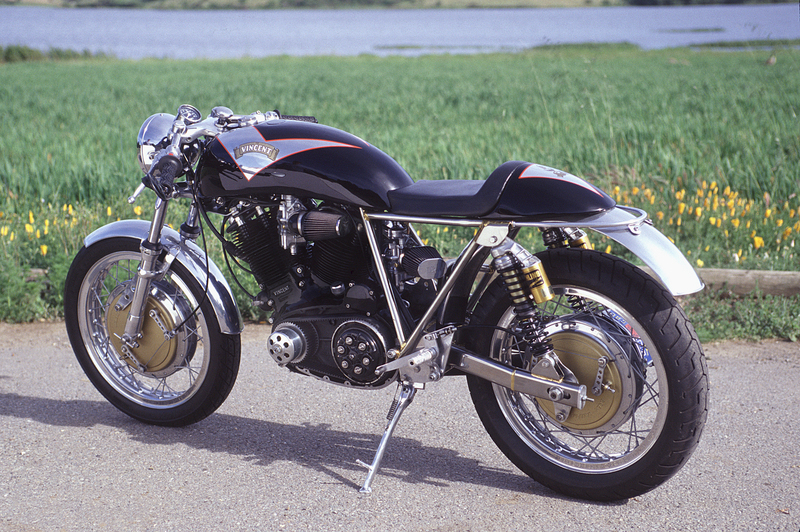 Note the superb Laverda Brakes. The bike is quite advanced at that stage, but still needs a lot of details and its final paint job. Paul explains that he had quite a strong mind about what he wanted, half way between a Classic Café Racer and a Hot-Rod. 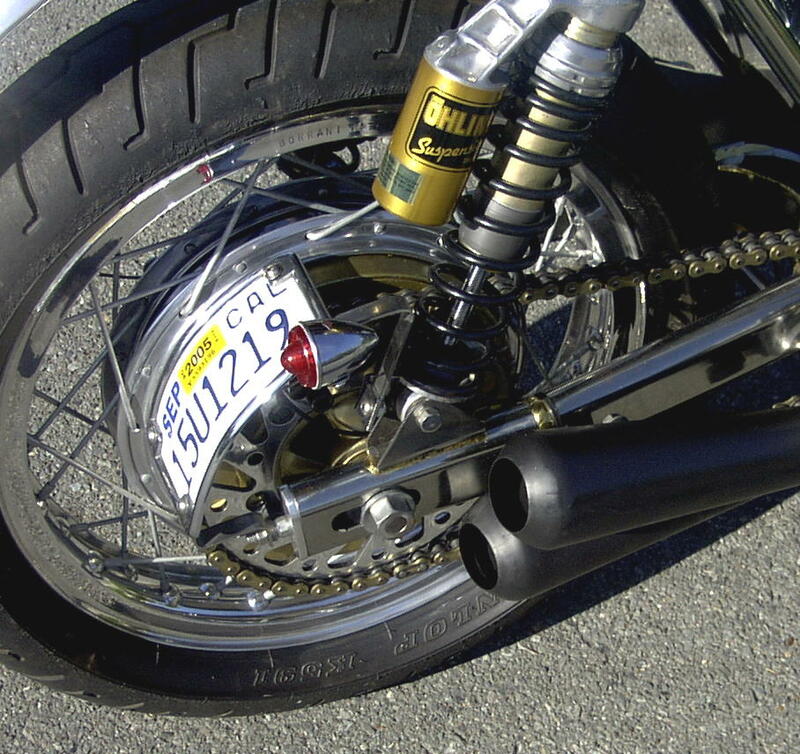 Thus he used an open primary belt transmission that he carefully machined and adapted from Harley Davidson. The frame came painted black; Paul stripped the paint and loved the contrast between the steel and the brass joints. So he decided to polish the frame and apply a clear coat, as the frame is not made from stainless grade. 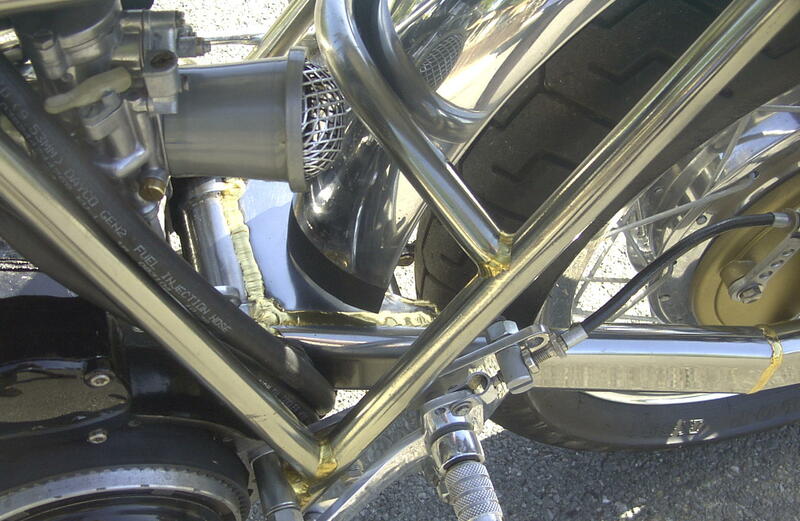 Note that the battery is hidden under the swinging arm. Another Hot-Rod detail is the side license plate fitted on the rear axle with the tail light. Note as well the exhausts, which reminds me the MV Agusta of the good old days. Ignition: Electronic Ignition with back-up Lucas magneto, rebuilt by John Cooper. Exhaust: capped with shorty aftermarket megaphones. (1) The “Snarling Beast” is the first nickname given to the 1000 Vincent before WWII with the advent of the Series A. (2) Te BSA A65 Lightning was the road model while the BSA A65 Hornet a kind of dirt bike preparation for Racing. Many thanks to Paul Zell, the owner who made himself available to answer my questions. Prev The Parkin-Vincent, in the wake of Nero.